Maria Dowling Artist - PRESS COVERAGE Evening Echo, 16th January, 2019 17th January, 2019 17th January, 2019.Maria Dowling with Mary Daly at the opening of the 2018 Maclise Society exhibition in the Cork School of Music. Evening Echo, 12th April, 2017. The Irish Examiner, 11th March, 2017 Press coverage of the opening of my solo exhibition in the Old Market House Arts Centre, Dungarvan July, 2016. Presenting a limited edition print 'A Gallop on the Beach' to Rotary District Governor Declan Tynor with Anthony Cleary President Rotary Fermoy and Pat Tynor in the Grand Hotel Fermoy on 7th July, 2015. At the Maclise Art Society exhibition 7th May, 2015 with Niall O'Neill President of the Maclise Art Society and Michael D. Higgins, President of Ireland. At the openign of the members exhibition in the Lavit Gallery March 2015 with Mary Gough and Diane Dowling At the Lavit Gallery for the Members Seletion Exhibition 2013 with Diane Dowling and artist James McCarthy. At the presentation of a print of 'Fermoy Bridge' to Verity Swan the District Governor of Rotary IrelandSeptember, 2014. From the Wexford Echo, 30th April, 2013. Exhibition in the Cockleshell Gallery, Duncannon. Picture taken from the New Ross Standard, 2nd April, 2013. Ben Barnes, Director of the Theatue Royal, Waterford who opened the exhibition. Ardmore Exhibition 22nd June - 9th July, 2010 Picture from the Avondhu press, at the Killavullen Farmers Market arts and crafts special market July, 2014. Maria Dowling with Mary Daly at the opening of the 2018 Maclise Society exhibition in the Cork School of Music. Evening Echo, 12th April, 2017. Press coverage of the opening of my solo exhibition in the Old Market House Arts Centre, Dungarvan July, 2016. Presenting a limited edition print 'A Gallop on the Beach' to Rotary District Governor Declan Tynor with Anthony Cleary President Rotary Fermoy and Pat Tynor in the Grand Hotel Fermoy on 7th July, 2015. At the Maclise Art Society exhibition 7th May, 2015 with Niall O'Neill President of the Maclise Art Society and Michael D. Higgins, President of Ireland. 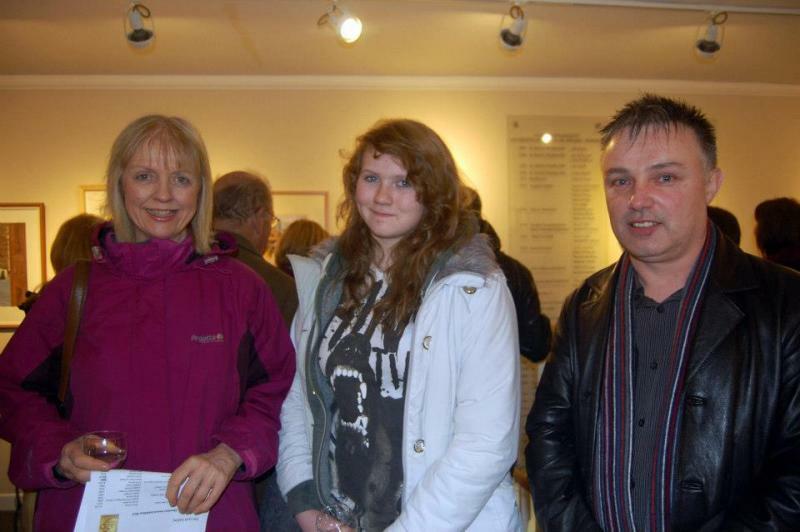 At the Lavit Gallery for the Members Seletion Exhibition 2013 with Diane Dowling and artist James McCarthy. From the Wexford Echo, 30th April, 2013. Exhibition in the Cockleshell Gallery, Duncannon. 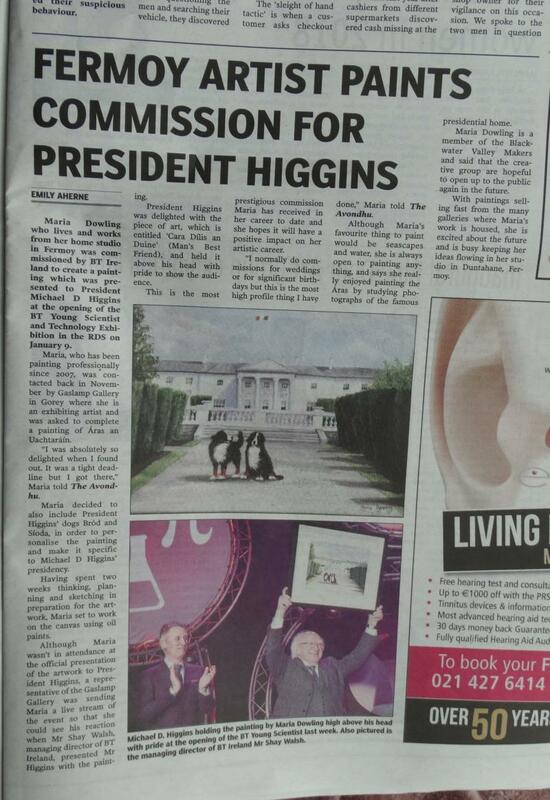 Picture taken from the New Ross Standard, 2nd April, 2013. Ben Barnes, Director of the Theatue Royal, Waterford who opened the exhibition. 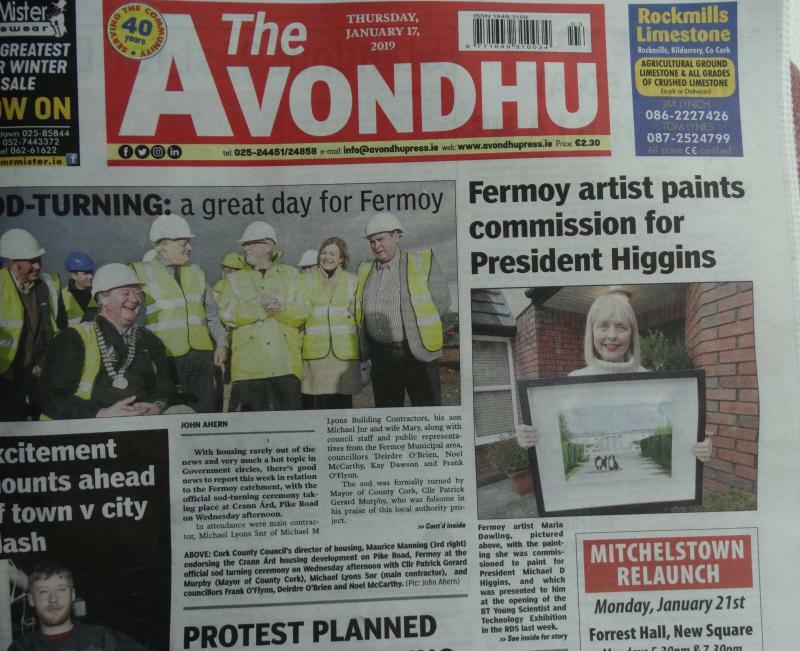 Picture from the Avondhu press, at the Killavullen Farmers Market arts and crafts special market July, 2014.